A really beautiful piece of Northwest art, this Hand Blown Glass Votive Candle Holder by Totally Blown Glassworks of Seattle, is a myriad of rich earth tone colors. It’s uniquely blended colors warm up a room when lit and catch the sun to glow in the daytime. Truly fascinating to watch and enjoy! It makes a great color accent to any room, substantial in size measuring approximately 4.5x4.5x4.5 inches. Nestled amongst Pacific Northwest gourmet foods including Portlock's Smoked Salmon Fillet, Partner's Crackers, Brie Cheese, Outrageous Offerings Chipotle Cashews, Seattle Sinsations Buttery Pretzels, Seattle Chocolate Truffles, and Seattle's Own Shortbread. 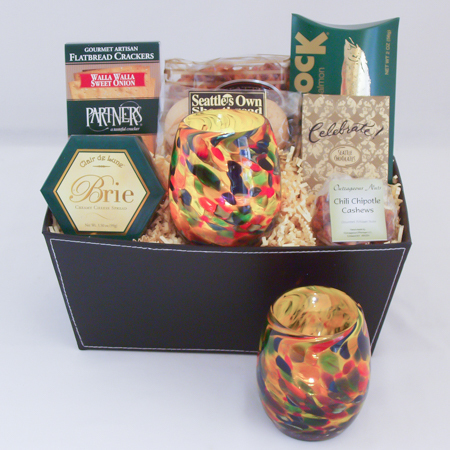 Artfully arranged in a black home decor storage box, this elegant gift basket is a perfect realtor gift for a housewarming, a thoughtful get well gift, an impressive executive gift, wedding gift, or a Happy Birthday gift for a man and Happy Birthday gift for a woman.